If you want to boost your brainpower, one of the best choices you can make is to eat more unprocessed whole foods. Real foods are full of the vitamins, minerals, antioxidants and countless other phytochemicals that nourish your brain cells (and even grow new ones). So when choosing your foods remember that it’s not only a matter of how many calories they contain and whether or not they might make you “fat” – it’s a matter of choosing those that contain the nutrients to support optimal health, including that of your brain. Turmeric is a yellow spice often used in curry that contains the anti-inflammatory antioxidant curcumin. Curcumin is capable of crossing your blood-brain barrier, which is one reason why it holds promise as a neuroprotective agent in a wide range of neurological disorders. Research has shown that curcumin may help inhibit the accumulation of destructive beta amyloids in the brain of Alzheimer’s patients, as well as break up existing plaques.3 Curcumin has even been shown to boost memory and stimulate the production of new brain cells, a process known as neurogenesis. Also remarkable, animal research suggests another bioactive compound in turmeric called aromatic-turmerone can increase neural stem cell growth in the brain by as much as 80 percent at certain concentrations.4Neural stem cells differentiate into neurons and play an important role in self-repair. The findings suggest aromatic-turmerone may help in the recovery of brain function in neurodegenerative diseases such as Alzheimer’s and stroke (provided the effect also applies to humans). A word to the wise… some curry powders may contain very little curcumin compared to straight turmeric powder, so choose the latter for the best health benefits. The omega-3 fats found in wild Alaskan salmon help fight inflammation throughout your body, including in your brain, and offer numerous protections to your brain cells. This is an area of your brain that is associated with working memory. They also noticed changes in other parts of the brain, including the occipital cortex (the visual processing center) and the cerebellar cortex (which plays a role in motor control). You can get omega-3 fats in therapeutic doses by taking a supplement like krill oil. But if you’re looking for a food source, wild Alaskan salmon(along with sardines and anchovies) is among the best. Many are concerned about radiation from Fukushima contaminating the salmon, but our primary source is Vital Choice and they regularly check for this radiation and never find it in their salmon. Broccoli and cauliflower are good sources of choline, a B vitamin known for its role in brain development. Choline intake during pregnancy “super-charged” the brain activity of animals in utero, indicating that it may boost cognitive function, improve learning and memory, and even diminish age-related memory decline and the brain’s vulnerability to toxins during childhood, as well as conferring protection later in life.7 Eggs and meat are other food sources of choline. Walnuts are good sources of plant-based omega-3 fats, natural phytosterols, and antioxidants, and have been shown to reverse brain aging in older rats. DHA, in particular, is a type of omega-3 fat that’s been found to boost brain function and even promote brain healing, although it’s more plentiful in animal-based omega-3 sources, like krill and wild Alaskan salmon, as opposed to walnuts. Walnuts contain a number of other neuroprotective compounds as well, including vitamin E, folate, melatonin, and antioxidants that lend even more brain benefits. Research shows walnut consumption may support brain health by increasing inferential reasoning in young adults,9 for instance. Celery is a rich source of luteolin, a plant compound that may calm inflammation in your brain, which is a primary cause of neurodegeneration. Luteolin has also been linked with lower rates of age-related memory loss in mice, and older mice fed a luteolin-supplemented diet scored better on learning and memory tasks.11 In addition to celery, peppers and carrots are also good sources of luteolin. The primary fuel your brain needs for energy is glucose. However, your brain is able to run on more than a single type of fuel, one being ketones (ketone bodies), or ketoacids. Ketones are what your body produces when it converts fat (as opposed to glucose) into energy. The medium-chain triglycerides (MCT) found in coconut oil are GREAT source of ketone bodies, because coconut oil is about 66 percent MCTs. Medium-chain triglycerides go directly to your liver, which naturally converts the oil into ketones. Your liver then immediately releases the ketones into your bloodstream where they are transported to your brain to be readily used as fuel. While your brain is quite happy running on glucose, there’s evidence suggesting that ketone bodies may actually help restore and renew neurons and nerve function in your brain, even after damage has set in. The antioxidants and other phytochemicals in blueberries have been linked to improvements in learning, thinking and memory, along with reductions in neurodegenerative oxidative stress. They’re also relatively low in fructose compared to other fruits, making them one of the healthier fruits available. Wild blueberries, which have high anthocyanin and antioxidant content, are known to guard against Alzheimer’s and other neurological diseases. Is Your Sweet Tooth Killing Your Brain? We’ve covered some of the best foods for your brain, but equally important is what foods to avoid. In the video above, Dr. David Perlmutter, author of Grain Brain, shares his insights into how to protect your brain health and even prevent Alzheimer’s disease using a key dietary strategy… namely, avoiding sugar and carbohydrates. He cites research from the Mayo Clinic, which found diets rich in carbohydrates are associated with an 89 percent increased risk for dementia. Meanwhile, diets high in healthy fats are associated with a 44 percent reduced risk. As you over-indulge on sugar and grains, your brain becomes overwhelmed by the consistently high levels of glucose and insulin that blunts its insulin signaling, leading to impairments in your thinking and memory abilities, eventually causing permanent brain damage. Additionally, when your liver is busy processing fructose (which your liver turns into fat), it severely hampers its ability to make cholesterol, an essential building block of your brain that is crucial for optimal brain function. Indeed, mounting evidence supports the notion that significantly reducing fructose consumption is a very important step forpreventing Alzheimer’s disease. In addition, we all create something called zonulin in the intestine in response to gluten. Gluten proteins, found in wheat, barley and rye, make your gut more permeable, which allows undigested proteins and gut contents such as bacteria to get into your bloodstream that would otherwise have been excluded. That then sensitizes your immune system and promotes inflammation and autoimmunity. Once gluten upregulates permeability in your gut, it then becomes “leaky” and all manner of previously excluded proteins—including casein and other dairy proteins—have direct access to your bloodstream, thereby challenging your immune system and contributing to the loss of self-tolerance, the very definition of autoimmunity. According to Dr. Perlmutter, much of our current disease burden, including brain diseases, stems from the fact that we are contaminating our immune systems with proteins to which the human immune system has never, in the history of humankind, been previously exposed to. Your brain is not “programmed” to shrink and fail as a matter of course as you age. In fact, you can build a bigger, better brain by making smart choices. Lifestyle strategies that promote neurogenesis and regrowth of brain cells include the following. 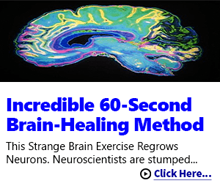 All of these strategies target a specific gene pathway called BDNF or brain-derived neurotrophic factor, which promotes brain cell growth and connectivity as demonstrated on MRI scans. Exercise. Physical activity produces biochemical changes that strengthen and renew not only your body but also your brain—particularly areas associated with memory and learning. Reduce overall calorie consumption, including intermittent fasting if you are insulin resistant. Reduce carbohydrate consumption, including sugars and grains. Increase healthy fat consumption. Beneficial health-promoting fats that your body—and your brain in particular—needs for optimal function include organic butter from raw milk, clarified butter called organic grass fed raw butter, olives, organic virgin olive oil and coconut oil, nuts like pecans and macadamia, free-range eggs, wild Alaskan salmon, and avocado, for example. Increase your omega-3 fat intake and reduce consumption of damaged omega-6 fats (think processed vegetable oils) in order to balance your omega-3 to omega-6 ratio. Krill oil works well for this because (like wild Alaskan salmon) it also contains astaxanthin, which appears to be particularly beneficial for brain health. As explained by Dr. Perlmutter, it belongs to the class of carotenoids, and is very “focused” on reducing free radical-mediated damage to fat, and your brain is 60 percent to 70 percent fat. Should Children be Allowed to try Cannabis Before Chemo?